I wanted to document Archie's 1st Birthday, we was so lucky that his birthday fell on bank holiday Monday so it meant we could celebrate all together as a family. We got up and all went in to him and started singing Happy Birthday, as usual he was full of smiles, I was excited for him to see all of his presents downstairs so we took him downstairs after giving him a change, while the whole time Isla kept saying Happy Birthday Archie over and over again. He loved opening his presents, towards the end he was really starting to get the hang of it and knew he needed to pull the paper off. He was so spoilt by lots of gifts, money, clothes and gift cards, he is such a lucky boy. His favourite toys were his phone, pirate ship, dumper truck and a spiky flashy ball that I picked up for him near a till. He also loved his push along Audi, but he had already had that as it was to big to hide for long but he still loved seeing it with his Mickey Mouse sitting in it. We got him dressed and then headed out for some lunch, one of his favourite foods is pizza - just like his Mummy! So it was only fitting we headed to one of our favourite restaurants, Pizza Express and treated him to lunch. Him and Isla share a kids portion, well to be fair he eats more than her haha so its a waste buying 2 meals. 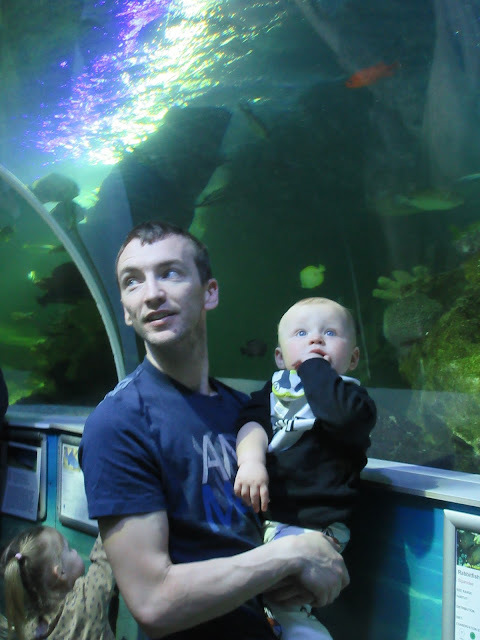 We all enjoyed our yummy food and then we headed to Southend to take him to the sea life centre, he has been obsessed with my parents tropical fish tank ever since he was able to sit in the highchair next to the tank, we also took Isla to the sea life in London so it was nice to do the same for Archie too. 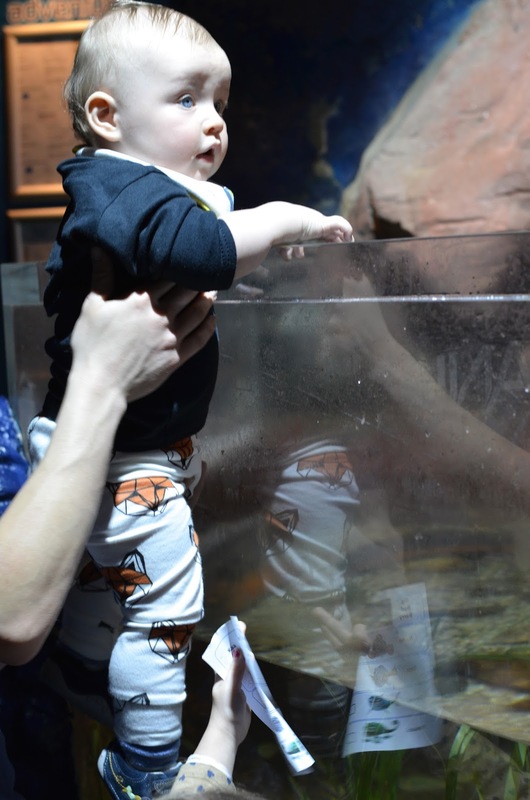 He loved the fish and looking into the tanks, although he was getting annoyed as he wanted to get down and crawl around - no way was that happening in his new Tobias & the Bear leggings! We done well to try and keep him happy and entertained and before we knew it we was at the exit and ready to come out. We had stupidly forgotten to bring coats, so we rushed over the road into the arcades to keep warm. 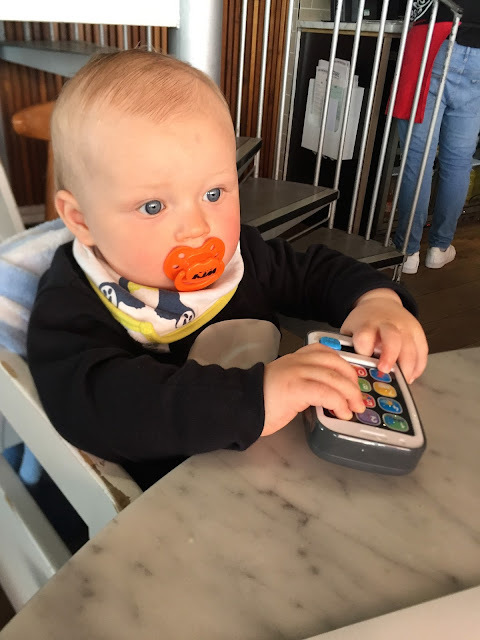 Isla loves playing on the 2p machines so we all had some fun and actually did really well and won some prizes which was exciting, Archie loves being in the arcades too, he just sits and watches all the lights and giggles at the cheesy music the machines make. At this point not only did we not have any coats and it was pretty miserable but now both our phones had died, we had to guess the time and figured as it was still pretty light we would head off and find a snack. 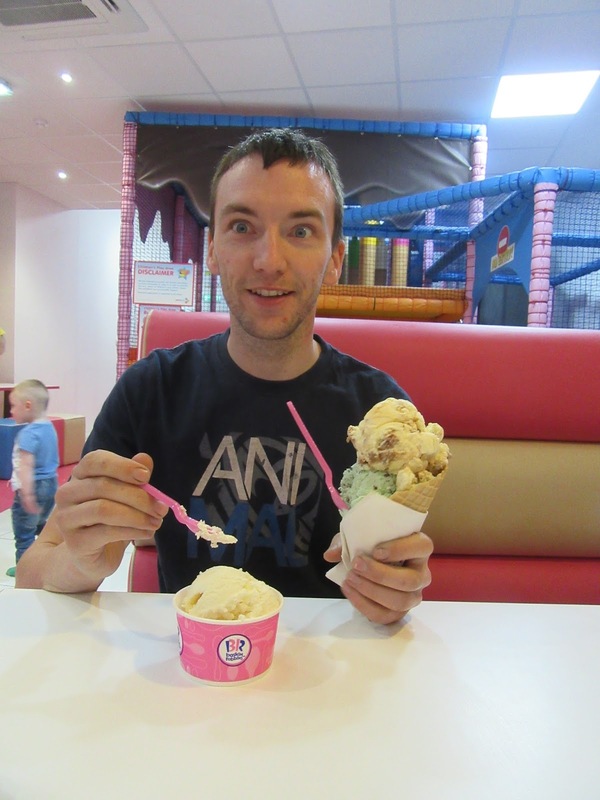 We found a really cool place that sold milkshakes, ice cream and cakes... AND had a little mini soft play built in, who ever owns it is a genius I tell you. Isla was happy playing and we was happy eating away on our cake and ice cream. Of course we got the Birthday Boy some ice cream too and he thouroughly enjoyed it, I'm not to sure how long we was in this place but it was just so fun like a wacky house. After a while we had to bribe Isla to leave and headed back to the car, when we got in we realised it was almost 8 pm! We still had over an hours drive home yet, but thankfully the kids soon fell asleep in the car and it turns out they had ice cream for dinner! Atleast it was Archies birthday though so its totally ok right? A beautiful ending to Archie's birthday was that on the way home we see an amazing rainbow shining right in front of us, it was so lovely and the perfect ending to our Rainbow Baby's 1st Birthday!